Popcorn is always nice to munch on during a movie. Unfortunately microwave popcorn sachets are about the worst thing you could eat when on a diet (and also when not on a diet!) However, the best popcorn is always homemade!! You can make your own popcorn to include no artificial flavors and no unhealthy fats. Grab a pot with a thick bottom and heat the coconut oil. When the oil is liquid, toss in the kernels and cover the pan with a lid. You’ll soon be hearing the kernels pop. 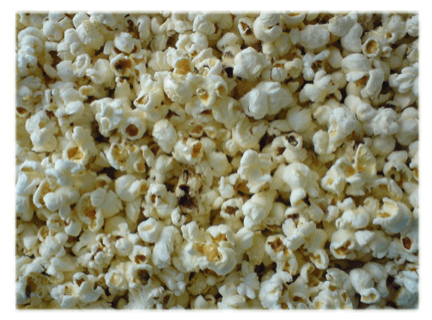 It is important you pay close attention to the kernels because they can burn quite easily. I advise you to shake every now and then so that the kernels won’t stick to the pan. Place 1 tbsp of honey into a large bowl. When all the kernels have popped, pop them into the bowl with honey and mix well. The heat of the popcorn will make the honey liquid enough to cover the popcorn. Set aside to cool for a few minutes. This popcorn will be sticky and delicious!